Have you ever had one of those long and tiring days that leaves you longing for a good meal? Not take out, not dinner at a restaurant, but home-cooked? 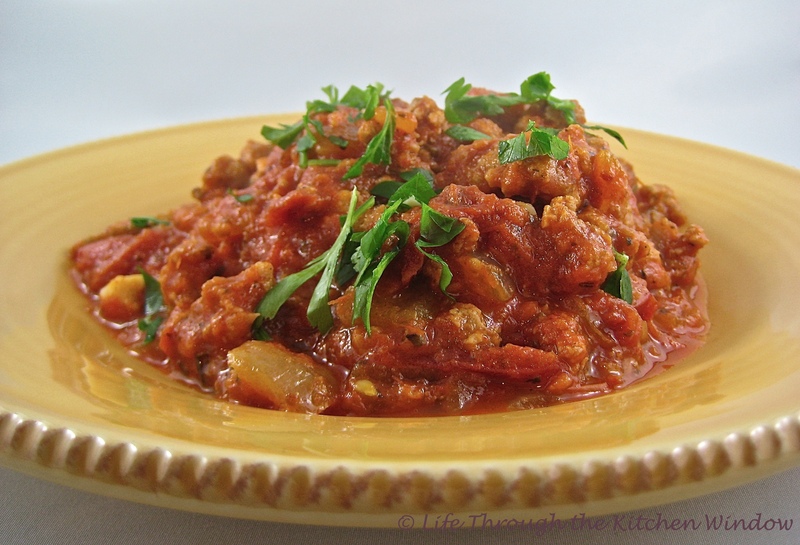 That’s when you need this easy spicy sausage and tomato sauce that you can make up quickly, leave to simmer while you shake off your day, and then serve over pasta, revitalizing yourself to enjoy the evening. I made this yesterday when I was bone-tired, which just goes to show that you don’t have to be at your best to produce a good meal. While the sauce was simmering I didn’t have the good sense to sit down and read or maybe sip some wine. No, the Culinary Enthusiast and I decided to tackle some housework instead. What was up with that? Oh well, not only does it look nice around here now, but we were well-rewarded by this meaty and richly tomatoey sauce with the kind of heat level that makes your eyes open in surprise. Served over tagliatelle pasta it was the kind of in-front-of-the-TV meal that makes you wonder why you ever go for takeout. Splash a tablespoon or two of extra virgin olive oil in a skillet, and turn the heat to medium high. Squeeze the filling out of three hot Italian sausages into the pan (don’t like hot? use mild then, or a combination). Break up the sausage with a spatula and stir. When it starts to render its juices add a small chopped onion, two finely chopped garlic cloves and some minced rosemary from the herb garden. 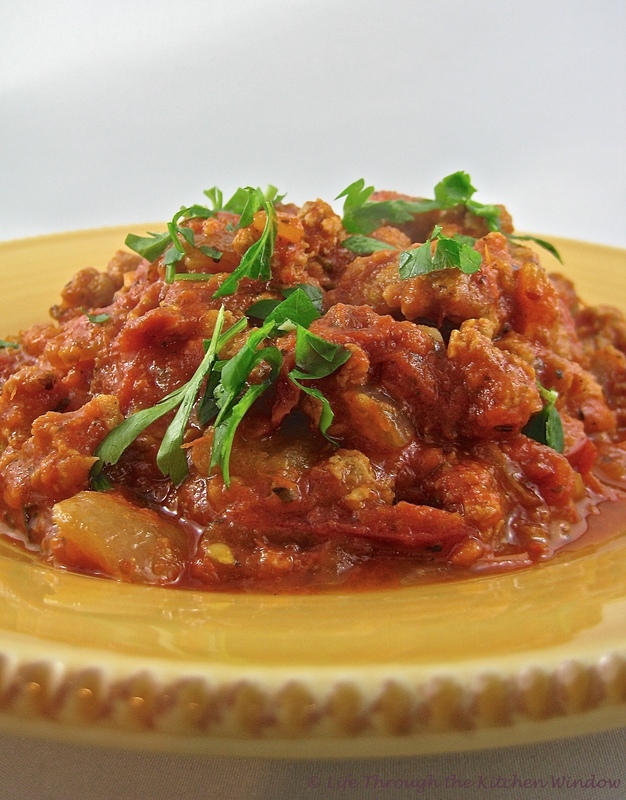 Add two cups of this tomato sauce base that you wisely made and froze in the early fall for evenings just like this. Turn the heat down, cover and stir occasionally until the frozen tomato sauce has thawed (unless you had the foresight to get it out of the freezer early enough). Add about 8 pieces of these slow-roasted Roma tomatoes, also from your freezer, a teaspoon or so of both dried oregano and basil, and some freshly ground pepper. This is also a good time to toss in some chopped flat-leaf parsley. And heck, if there are a few stray cherry tomatoes lolling about on the countertop, give those a quick chop and throw them into the skillet, too. Simmer covered for 45 minutes to an hour, stirring occasionally. The sauce will be quite thick. Near the end of its cooking time bring a pot of water to a boil and cook the pasta of your choice. If the sauce is done to your liking, simply turn off the heat and leave it covered while the pasta finishes cooking. Lavish the sauce over the pasta, garnishing with some more of the chopped parsley. Normally I would add red wine to my pasta sauce, but I didn’t this time and didn’t miss it. Next time, maybe I will; no recipe is written in stone. A sprinkling of grated Parmesan would be a nice touch too, but we were too hungry to get out the grater. Eating a meal like this is a great way to leave the cares of the day behind you. 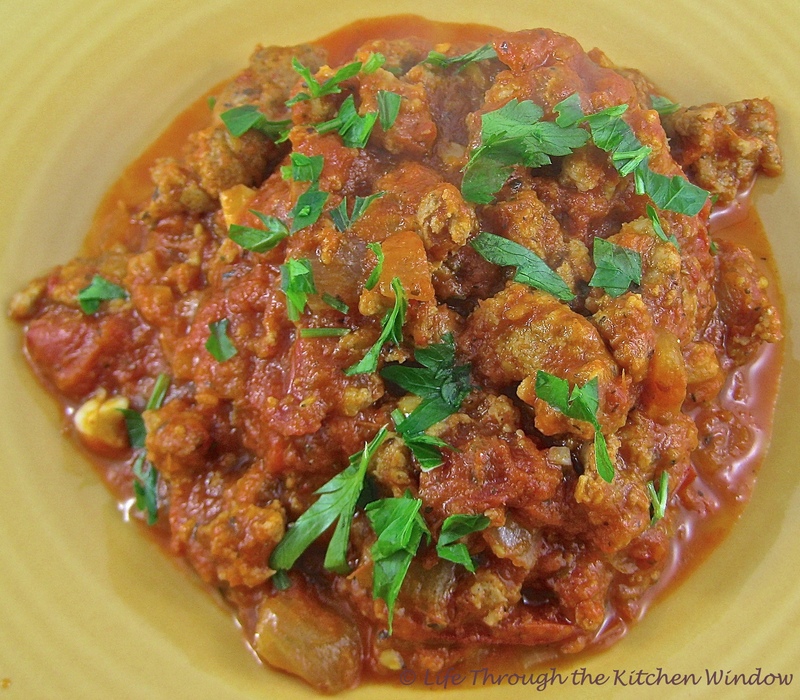 I’ll be making this dish, or variations of it, all throughout the winter, and I hope you’ll give it a try too! I bet that was great – I buy lots of Napoli sausages, which are very spicy. I’ve never had Napoli sausages. The ones I buy are marketed as Sicilian – how authentic they are, I don’t know, but the hot ones are pretty hot! Well that’s a coincidence, isn’t it? I’ve never made sausage, I just buy mine at the market. Oh no, I feel another project coming on … 😊 I don’t as a rule use only hot sausage (I might use two mild and one hot), and this dish was about as spicy as I like my food to get. It was still pretty tasty though! This was definitely not boring! More like, yum, now I need a glass of water exciting! Your phrase ‘contented cooking’ is wonderful … it perfectly describes that feeling I get when I’m creating something in the kitchen and the cares of my world melt away. And, as you said, it’s a feeling that comes when meals are simple and everything you need is at hand without running to three stores for ingredients.